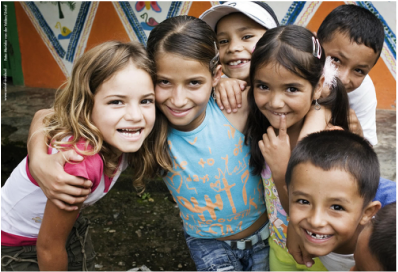 Established in 2007, the CCC Coalition advocates for and promotes the rights of children in climate change and disaster risk reduction policy and practice. The Coalition was conceived at the 13th Conference of Parties to the UNFCCC in Bali in 2007 (COP13), and officially launched at the climate change talks in Bonn the following year. Our original mandate was to ensure that children’s rights to protection and participation were respected in global negotiations at COP15 in Copenhagen in 2009. Since our formation, we have gone from strength to strength. The CCC coalition continues to host events and conduct and disseminate research highlighting the importance of child-centred disaster risk reduction and climate change adaptation. Increasingly children’s rights are being acknowledged by key stakeholders, including World Leaders and UN agencies in discussions on climate change and disaster risk reduction. However, more remains to be done, and we continue to call for the inclusion of children and children’s rights, in decision-making and action at all levels; from families and communities to global negotiations. Urgent attention, support and action is needed to address the issues faced by children worldwide as a result of increasing climate shocks and stresses. Our work is grounded in the understanding that children in developing countries have contributed least to the causes of climate change but are and will continue to be the worst affected by its impacts. Our research and experience also demonstrates that children can and should be an important part of the solutions to addressing climate change and reducing disaster risk. Children's experiences of and insights into climate change and disasters are different to those of adults, yet these are rarely considered in policy and practice.